A great message posted on Downtown Bicycles Facebook Page caught my eye. 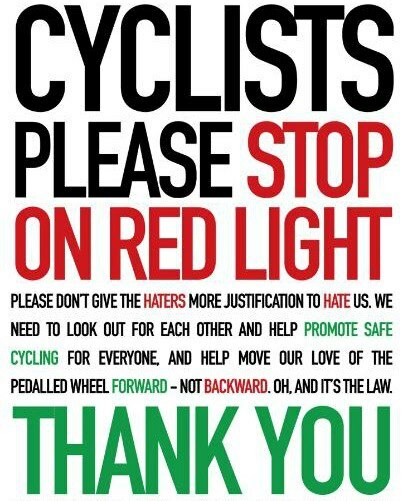 Many cyclists don't bother to stop on a red light, and don't look at themslves as a part of the traffic infrastructure. I won't hide the fact that there are may cyclist in Japan acting the same way. The message following the big text represents the thoughts of the other who ride following the traffic rules. Besides the fact that running a red light is dangerous, we cyclists must keep in mind that each on of us represent the whole cycling community, and our reputation will affect how we are looked at by the rest of the traffic comunity. This page contains a single entry from the blog posted on March 11, 2013 10:02 PM. The previous post in this blog was TeePee Guide - Japan Dining & Travel (iPhone/iPad app). The next post in this blog is Sapporo Travel Map.